I’ll be straight up front: this blog post is really just an excuse to post some pretty photographs of orchids! But also to encourage others to get out and explore these places on our doorstep – there are many excellent National Nature Reserves (NNR)’s and Wildlife Trust Sites within 30 minutes or so of Grantham, many of which are meadows which are designated for their botanical interest. I took the opportunity today, on a sunny Friday in June, to tour a few and see what I could find. The star attractions at many of the sites were the orchids – I found a total of seven species across five different sites – but many other interesting flowers were beginning to appear. Links below will take you to the webpages for each of the sites if you are planning a visit of your own! This site is a series of mounds, hollows and trails which are rather labyrinthine after a while – easy to get lost! They are situated around 20 minutes down the A1 from Grantham, just beyond Stamford. The site was formed by quarrying limestone in medieval times, it was first exploited over 1,500 years ago. 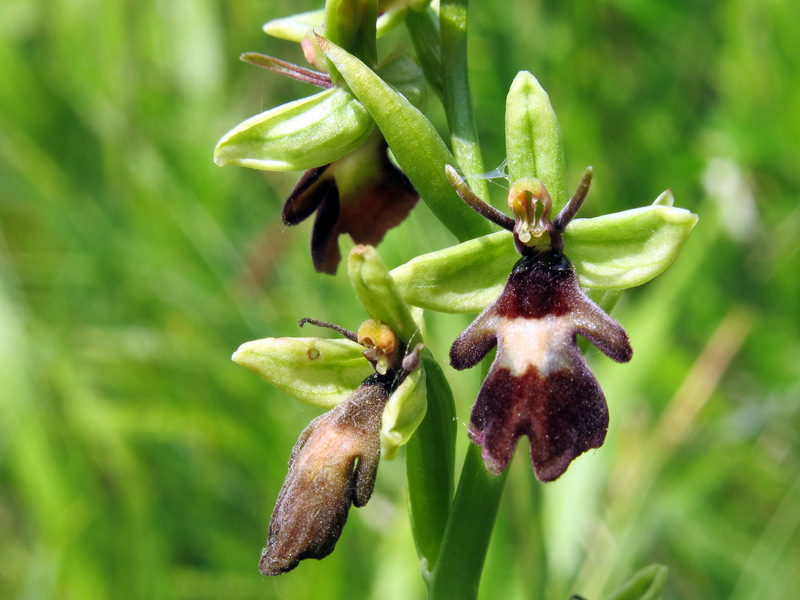 Now it is home to a stunning array of flora, including some flagship species such as the pasque flower (Pulsatilla vulgaris) and the man orchid (Orchis anthropophora) – both of which could still be found in early June. One very late pasque flower, along with the many seed heads from earlier blooms. This was my first stop today and the location of the first two orchid species – man orchid and fragrant orchid (Gymnadenia conopsea). 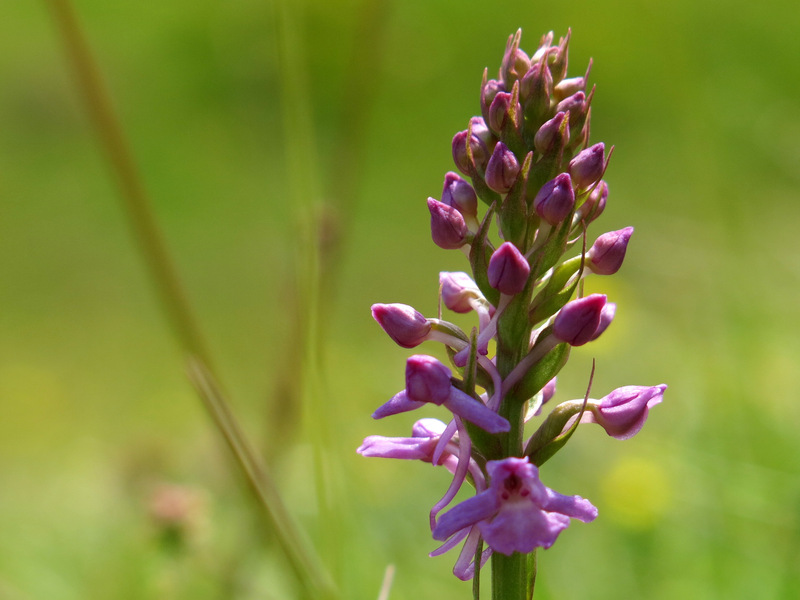 Fragrant orchid – the first orchid find of the day at Barnack Hills and Holes. Man orchids are one of the most threatened species of orchid in the UK and this site is one of the more northerly of its distribution. 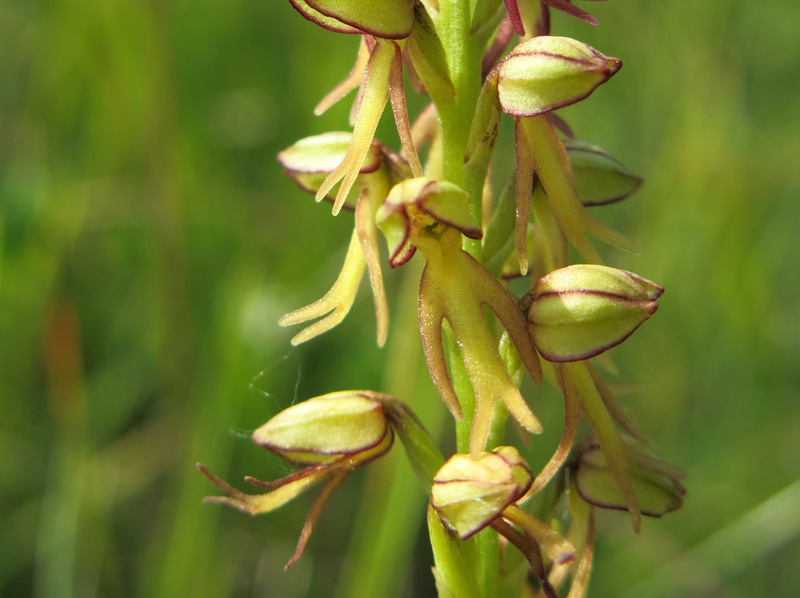 These are rather unassuming orchids at a glance, but quite intricate when you get down close to them. You can see the derivation of the name in the shape of the individual flowers. 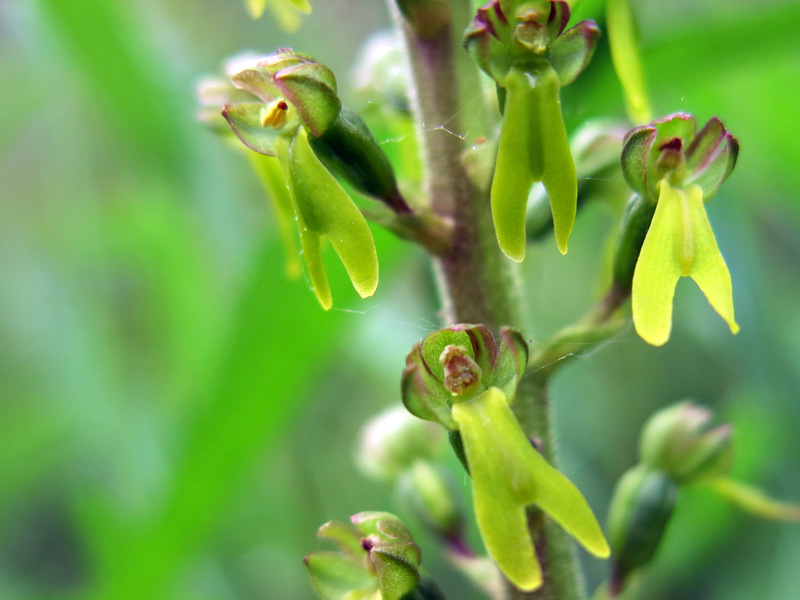 This is a close-up of the man orchid’s flower – they are have tall, narrow flower spikes. 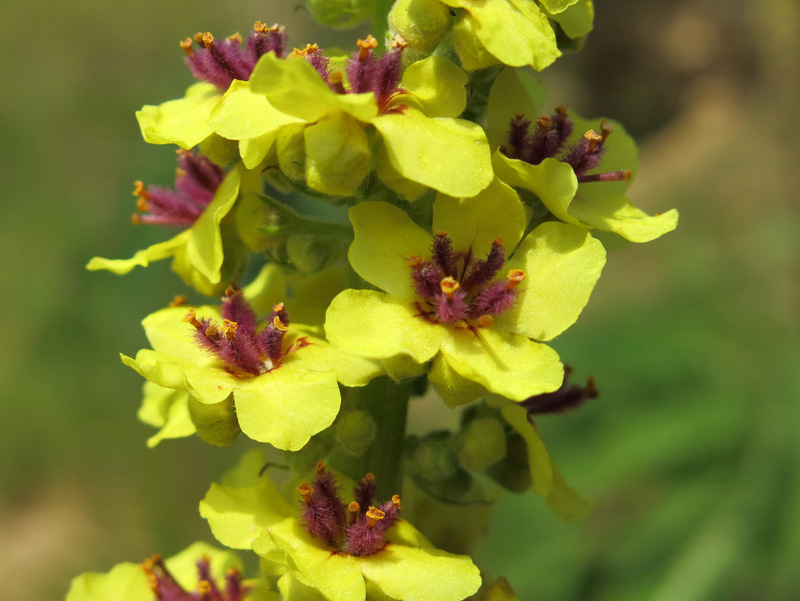 I found so many species in the limestone hummocks which I have never come across before but I will restrict myself to sharing just one other – this exotic flower is dark mullein (Verbascum nigrum). Close-up of the dark mullein flower spike – the incredible purple anthers set within the yellow flowers make this quite an exotic looking flower. Other species included milk vetch, kidney vetch, dropwort, common valarian, salad burnet, deadly nightshade, knapweed broomrape, rockrose, field mouse-ear and many more besides. A new site for me but a recommendation from @mushy1977 on twitter made a visit essential – it is just a few miles further down the A1 from Barnack, accessed off the A47. 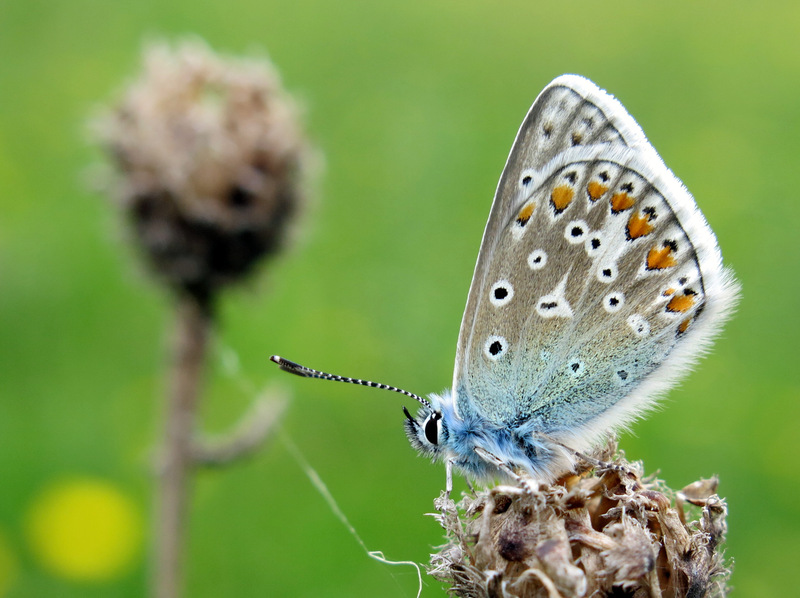 The site is predominantly woodland and has a range of interesting bird species including nightingale and lesser spotted woodpecker as well as hairstreak and fritillary butterflies. Definitely worth a return visit but today, I went in search of the diminutive brown-flowered fly orchid (Ophrys insectifera) and managed to find a single flower spike nestled within the long grass. On the way back to the A1, I stopped off at Wansford Pasture, a small meadow field with a wet flush running through and it is here that southern marsh orchids (Dactylorhiza praetermissa) thrive. There were many plants amongst the reeds, along with common spotted orchids (Dactylorhiza fuchsii) and at least some of the plants seemed to have intermediate characteristics, perhaps indicating hybridisation. 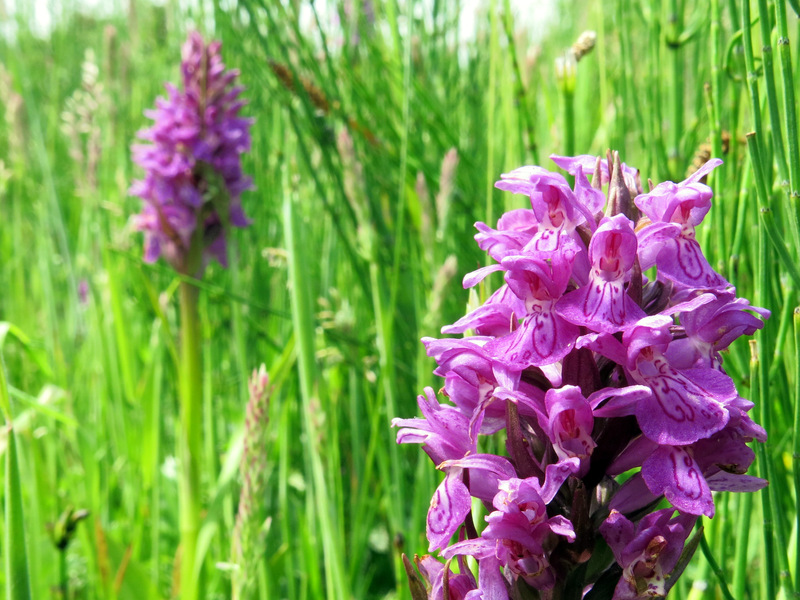 Southern marsh orchids at Wansford Pasture. Next stop was the third National Nature Reserve of the day – Cribb’s Meadow just outside of Thistleton on the way back towards Grantham. 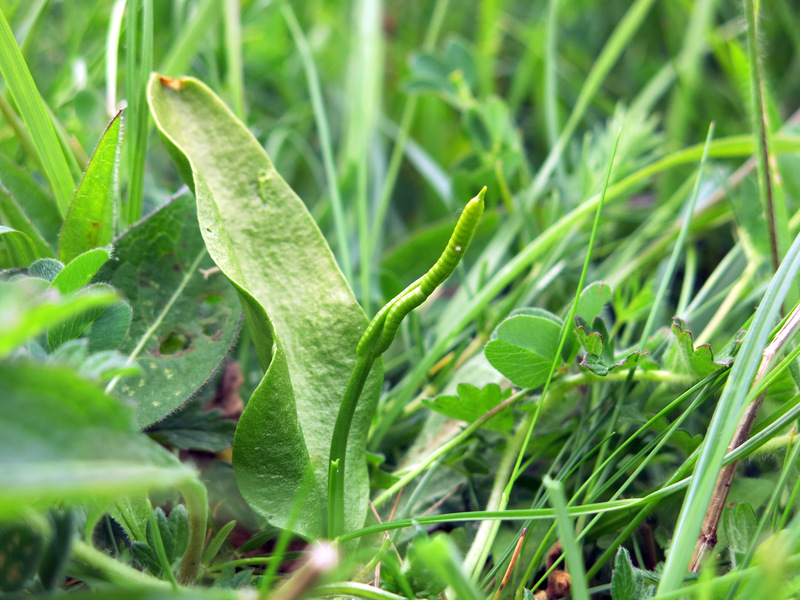 This has a number of important species, principally adder’s tongue fern (Ophioglossum vulgatum) – an species often associated with old grasslands. A fellow orchid hunter kindly showed me my first example of this species – it is easy to overlook amongst the other leaves and flowers of a meadow in June! Two more orchid species to add to the day’s list here. 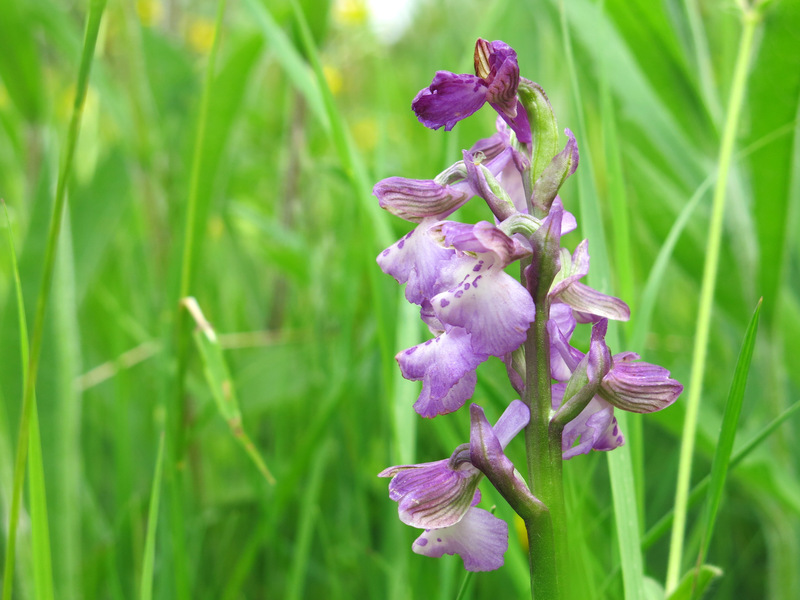 First is the green-winged orchid (Anacamptis morio) which were largely gone over – they reach their peak in May – but this specimen was still in flower at the far end of the meadow. Green winged orchid flowering at Cribbs Meadow NNR – you can see the green stripes in the lateral sepals which give the flower its common name. Walking along the base of a disused railway track which intersects the reserve, I came across a number of common twyblade (Neottia ovata) orchids. These are quite an inconspicuous species which could easily be overlooked unless you keep you eye in for their characteristic almost translucent green flower spikes in amongst the sward. Common twyblade flowers at Cribb’s Meadow NNR. Finally a stop at the South Witham Verges – a section of road verge designated for its limestone flora and used by a wide range of mammal and bird species. I had hoped to find bee orchids at this site, but no joy. 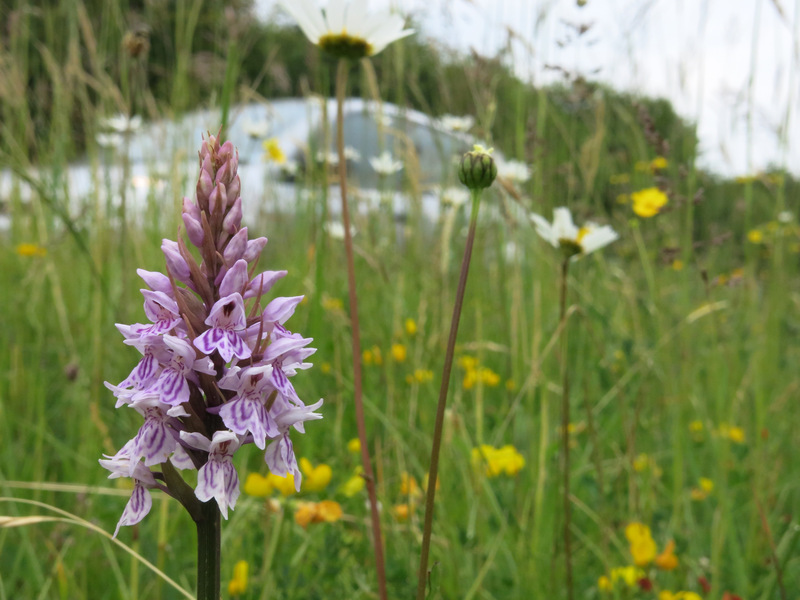 There were common spotted orchids (Dactylorhiza fuchsii) a-plenty however and it was inspiring to see how so many wildflowers flourish on a busy roadside – it just shows what is possible with the right management regimes! With so many great meadow nature reserves within 30-40 minutes drive of Grantham, I would suggest you check them out if you have a chance! To find even more wildlife sites, check out the Wildlife Trust’s: Find a Nature Reserve site. Common blue butterfly resting on a common knapweed seedhead at Cribbs Meadow NNR.